Student ahtletes came out to welcome golfers at last year's tournament. West Windsor, NJ. – Mercer County Community College (MCCC) invites friends and supporters of the college’s student athletes to hit the links on Monday, Oct. 2 for the Haldeman Auto Group Golf Classic for MCCC Scholarships, co-hosted by the Athletics Department. According to Ed Gwazda, Executive Director of the MCCC Foundation, the 26th annual tournament has already received generous support from numerous area corporations including Haldeman Auto Group, for which the tournament is formally named. Haldeman is also the Hole-In-One sponsor, with a new Lexus as the featured car. In addition to Haldeman Auto Group, main sponsors to date include: Homasote Manufacturing Co.; Adams, Gutierrez & Lattiboudere, LLC. ; The Bank of Princeton; Borden Perlman Salisbury & Kelly; Donald Fowler; David Fraytak; Rivertan Risk Management, LLC; TD Bank; Thomas Edison State University; Fulton Bank of New Jersey; Clarke Caton Hintz, PC; Stark & Stark; Domain Tech Academy at MCCC; Mercadien Group; Princeton Air Conditioning; Aamir Rehman; PRISM Advisory Group, LLC; Berkshire Bank Foundation, Inc.; The College of New Jersey Foundation, Inc.; Steve Ritzau; and Carpenter Contractor Trust NY/NJ. Co-chairs for the event are Lori Danko (DanMor Mechanical), David Fraytak, and Allen Silk (Stark and Stark). The tournament is held in memory of Dr. Cynthia Schaffer, who served as a member of the MCCC Foundation Board and was an avid supporter of youth sports. Other community members serving on the committee are: Herb Ames, Brian Bennett (Haldeman Auto Group), Sharon Cappella (Borden Perlman), Wayne DeAngelo, (NJ Assemblyman), John Donohue (The College of New Jersey), Warren Flicker (Homasote Manufacturing Co.), Marty Hammond (PFM Asset Management), Daniel Klim (American Physical Therapy Association of New Jersey), Savita Lachman (Fulton Bank of New Jersey), Howard Levy (MCCC men’s basketball coach), Brian McCloskey (MCCC Executive Director Finance), Eric Ludwig Esq., Scott Needham (Princeton Air Conditioning), Tom Perrino (Spiezle Architectural Group), Michael Procaccini (Northeast/NY Upstate Medical Group Insurance Services, Inc.), Steve Ritzau, Debbie Schaeffer (Mrs. G TV & Appliances), and Richard Simkus (Prism Advisory Group, LLC), Michael Sullivan (Clarke Caton Hintz, PC) and Dennis Walsingham (Glenmede Trust). 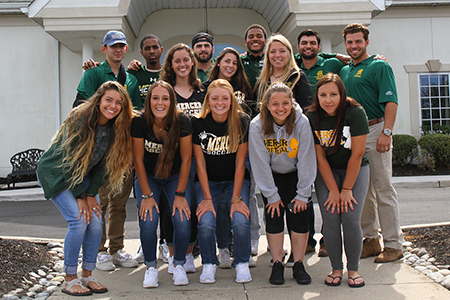 According to MCCC Athletics Director John Simone, the fundraiser helps numerous student athletes pursue their college goals every year. “These students consistently perform well in the classroom in addition to their sport. Community support sends them a message that we believe in them and are doing everything we can to insure their success,” Simone said. There are still numerous opportunities for sponsorships and purchase of individual tickets. For more information, call 609-570-3616 or click here. Participants and sponsors may register online; a printable registration form is also available online.